Spybrarian John Koenig is back from his expedition visiting almost every used book store from Michigan to Washington State. When he wasn’t scaling ladders (why are the good spy books always on the top shelf?) or scouring dark nooks and crannies he penned several review of recent spy reads. Here is his latest – The Spy and The Traitor by Ben Macintyre. So you want me to tell you about a book John le Carre calls “The best true spy story I have ever read”? How about you take the master’s word at face value, buy the book and get to opening the cover? If Macintyre hadn’t used “the greatest espionage story of the cold war” as his subtitle every reviewer would have utilized the line. You’re stuck with my thoughts and reaction to the book. I found The Spy and the Traitor to be Ben Macintyre’s finest work. If, like me, you own all his books, have read most of them, plus much of his newspaper writing, understand this to be the highest praise. Macintyre is one of the three finest contemporary military historians working, in my opinion. With this project he took a riveting, complex, important slice of Cold War history and wove it into a book as exciting as the best thriller novels. Using cliche expressions such as “I couldn’t put it down” and “the pages seemed to turn on their own” come to mind. They’re accurate. 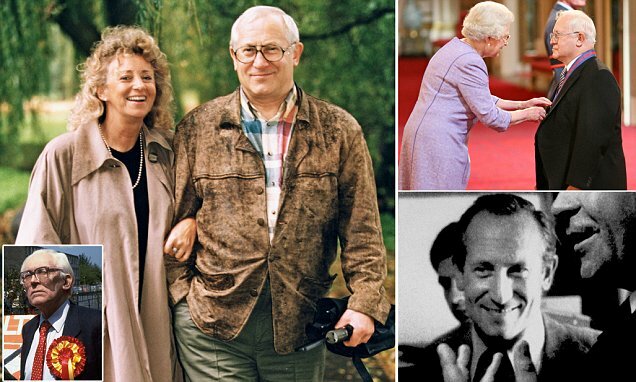 Former Soviet spy Oleg Gordievsky receives the Companion of the Most Distinguished Order of St Michael and Saint George from Queen Elizabeth II at Buckingham Palace where he was being recognised for services to UK security. Oleg Gordievsky is one of the legendary spies of all time, certainly the kingpin of spies in the Cold War era. If there was a vote it wouldn’t be close. Gordievsky’s father was KGB; Gordiesky’s wife was second generation KGB. Oleg grew up worshipping Soviet ideals and went into the KGB, rising in the ranks. He was unusually intelligent, handled himself well, and was destined for great things in the Soviet intelligence world. So how did he end up the most valuable spy MI6 has ever had in the Russian KGB, passing on superb intelligence for a decade? Early in his career, exposure to Western European society swiftly changed Gordievsky’s thinking about communism, the Soviet state, and everything burned into his brain his entire life. After a couple of bungled attempts to get the attention of MI6, once the connection was made the information pipeline opened. To say he lived a dangerous life is an understatement. Macintyre effectively presents the tension Gordievsky lived with, overlays it with his career, wrapped in an informative narrative that plays like a novel, or a great movie. Some of the most dramatic moments of the Cold War took place while Gordievsky was front and center. Reading The Spy and the Traitor, I found myself amazed these are true tales from the front lines of the Cold War. In interviews for the book, Macintyre discusses how fortunate he is to have been able to interview virtually every case officer or agent involved with Gordievsky during his career. They are all alive and made themselves available to him. Of course I’m not giving anything away telling you Oleg is alive and well, living in hidden seclusion. Macintyre spent countless hours talking with him, as well. What a priceless opportunity for a historian. Macintyre’s work putting together the challenging (understatement), precarious tale of how Gordievsky was brought in from Russia is unbelievable. But it’s true. If I saw this plot in a movie I’d laugh at how implausible it is. But it’s all true, and how Macintyre weaves everyone’s stories together is masterful. The Spy and the Traitor is a spellbinding work bringing to life a critical period in modern spy and espionage history. All manner of names and characters prominent in English, Russian and American spy history come to life during Gordievsky’s career, including Aldrich Ames. I cannot attempt to give a skim re-telling of the story contained within this book. Anyone with more than a passing interest in the Cold War must read The Spy and the Traitor.